Have you been missing out on the computer revolution? Have you watched as others have made micro-chip millions around you? 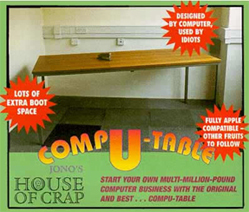 Have you thought that if only you could get hold of the right equipment you could make millions too?Finally the gear you’ve been waiting for is on the market (while stocks last) – Jono’s Compu-table. Ergonomically designed by egg-heads at our top-secret research laboratory in the San Fernando Hills, it’s the all-round computer solution that will help you make MILLIONS. Whether it be for home or office use the COMPU-TABLE will enable you to process megabytes of information in comfort and security. It’s easy to operate too – a child could do it – and has none of the awkward moving parts that can get in the way of you and your computing. Made of the highest quality poly-fibre chipboard? you can put it almost anywhere in seconds and get on with the job you need it for. So don’t just sit there with the wrong equipment. Get into the top flight with the desk of the future. Buy COMPU-TABLE… and start making big money. Phone Basingstoke 009 and ask for Jim in Sales. – grey, black and charcoal.